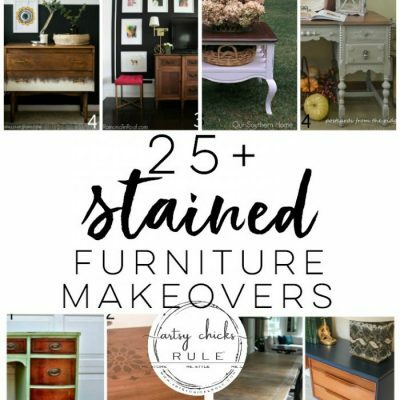 It doesn’t have to be hard to update wood stained furniture! 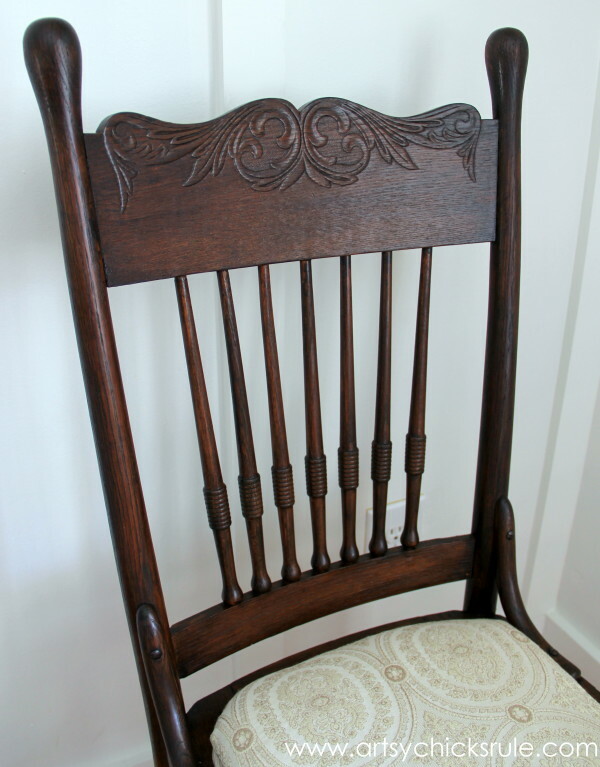 Especially when you have products like this wonderful Java Gel Stain to use on a gorgeous antique press back chair like this…. Last month’s theme was “Inspired by”. I made over nightstands. You can it here –> “Pretty in Pink Parisian Makeover“. 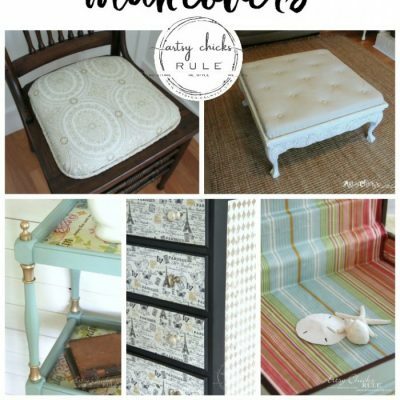 AND, you can see the rest of the previous makeovers here — > “Themed Furniture“. I found this chair I updated a year or two ago. It was $8 and I couldn’t pass it up. 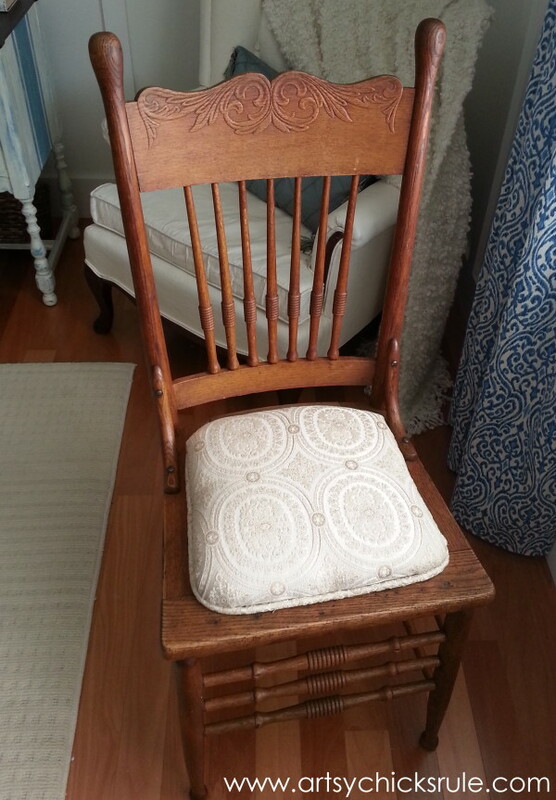 It had a broken cane seat but the wood and pressed back was so pretty! But it was orange-y like a lot of old furniture is. I know the “purists” out there will be upset that I stained it a bit darker instead of leaving it at is. I really did consider leaving it as is and just polishing up the wood. I really, really did. I also considered painting but I just couldn’t bring myself to do it for some reason. 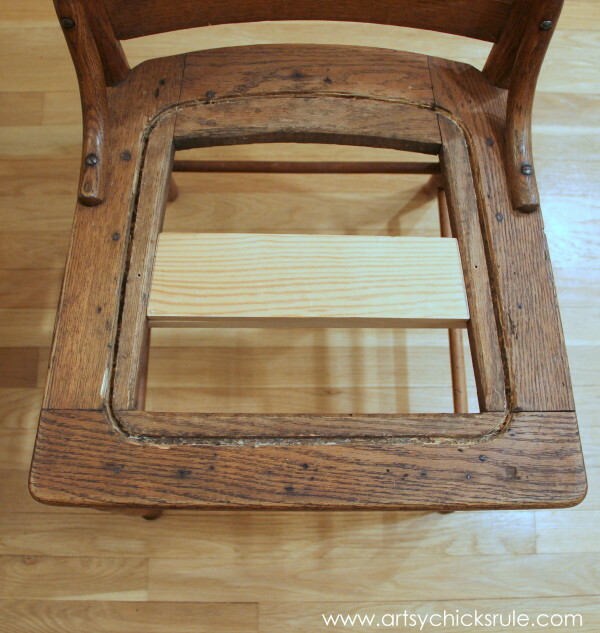 But sadly, to me anyway, this press back chair needed something…..it just looked BLAH. I didn’t want to fix that because I honestly don’t love those seats. I envisioned a pretty upholstered seat there instead. 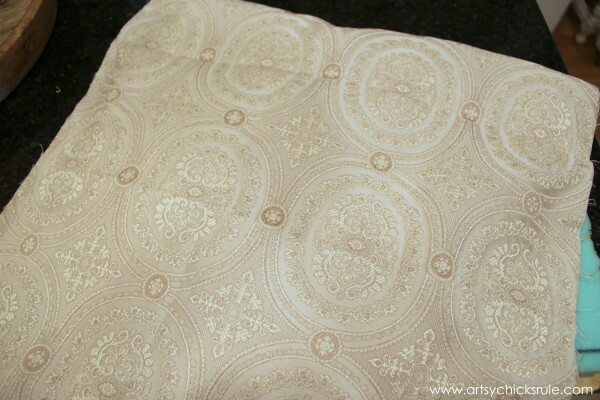 When I found the fabric for my “Pretty in Pink” nightstands, I came across this gorgeous fabric in the $5/yard bin. 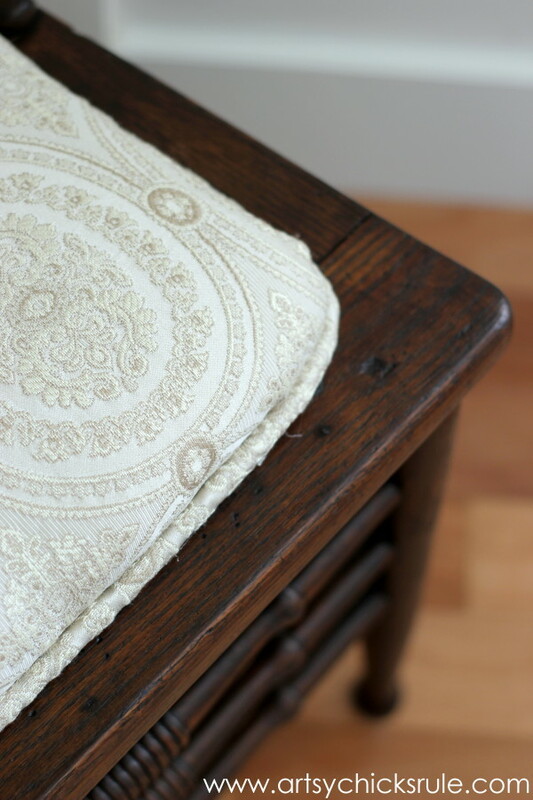 Perfection for this old antique chair. So I had my husband remove the cane and put a support under the opening. Then he cut me a “seat”. 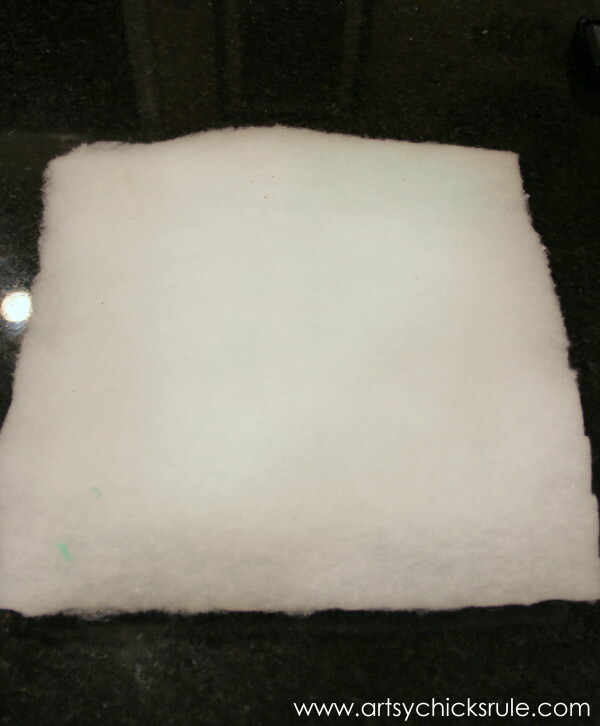 I had this foam (this stuff is pricey!) 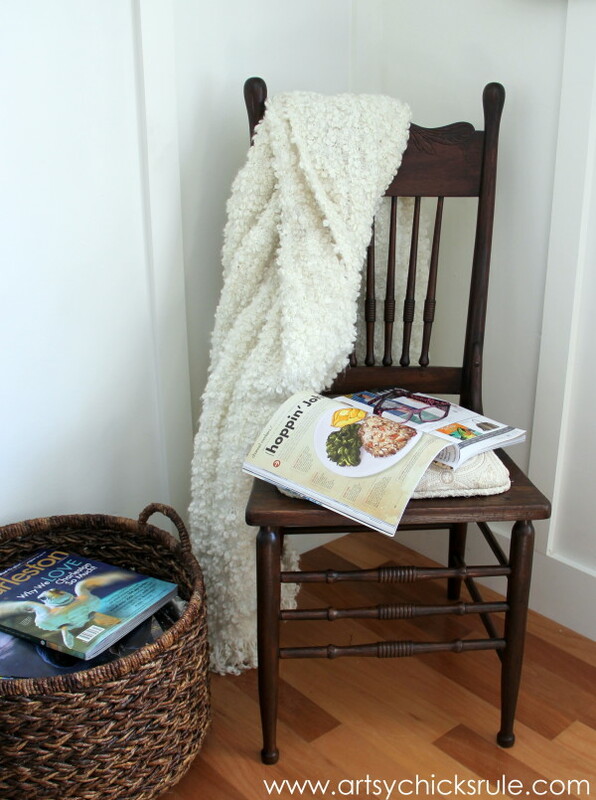 from when I created a new foam seat for the “French Chalk Painted Chair” I did last year. It was also part of “themed furniture day”. Anyway, I had just a bit left and decided to use it for the seat. I ended up having to piece it together. I cut another thin strip and hot glued it in the center gap there. I glued it all down to the board. Then I put some batting over top of that. I wrapped it around the board and then attached the fabric with my staple gun. It needed something because it just didn’t look finished to me. I don’t sew and that’s usually a sewing kind of thing. But my friend Christy showed how to do a no sew version and I followed that. Only I didn’t have any cording….but I did have ROPE. Haha, yes, my piping is made with rope. Not bad, I don’t think. And what a difference it made. Wow. But it was still BLAHHHH. Ok, it’s not terrible but just not right. Plus I had a little trouble with a moving sticker that had been on for 30 years (seems like it anyway). I couldn’t get all the adhesive off but I did remove some stain! Oops. So I considered painting it…or staining it darker. Staining darker won because I didn’t want to cover up that wood. I used Java Gel Stain and I love this stuff! Have you used it? If you haven’t, you really need to give it a go! 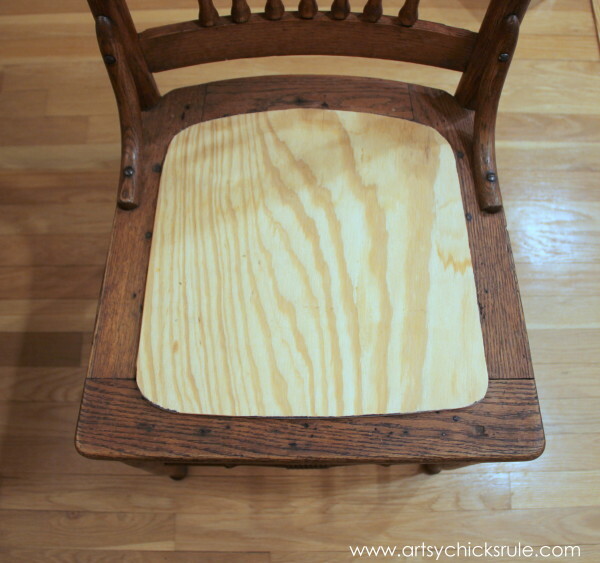 I lightly sanded the whole chair, cleaned it well and then used an old t-shirt to apply the stain. After that was dry, I applied Arm-R-Seal over top (in satin) to seal it. The wood grain actually shows up more. It’s just so beautiful and rich looking. 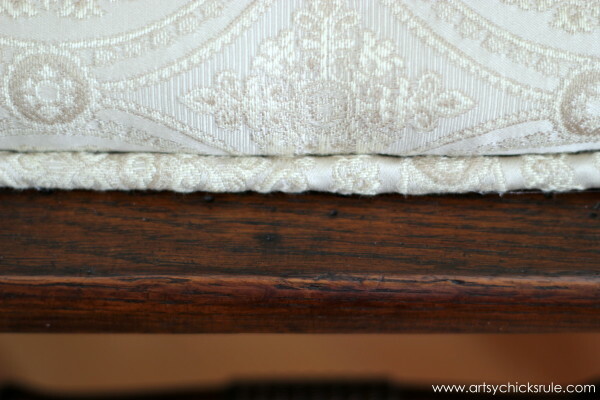 I ADORE how this stain made the press back chair look. 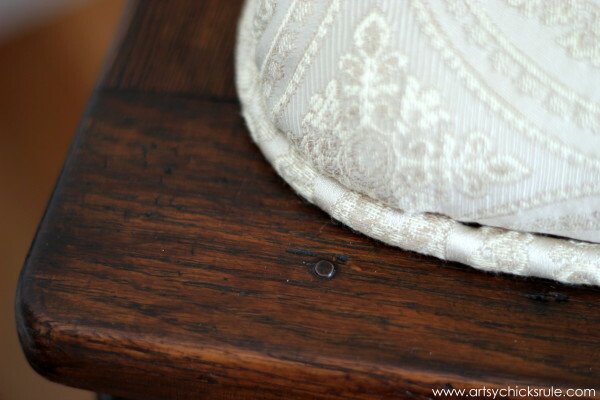 Isn’t it gorgeous in that darker shade with that pretty cream colored fabric?? I think so! But I’m a contrast loving girl. 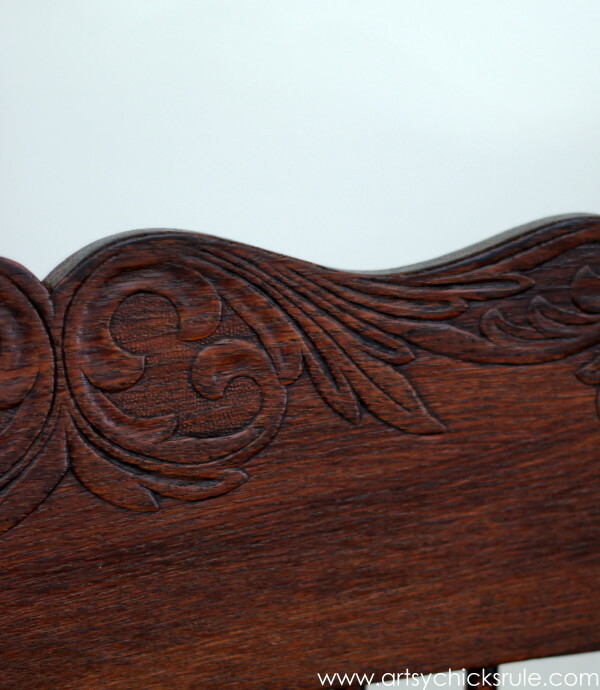 And some up close shots of the wood on the seat….and all of it’s imperfections. I love all the bumps, nicks and nails, etc. The chair is actually very comfortable to sit on now. I love it … and want to keep it. Surely you can never have too many chairs, right? Ha…too bad I have no place for it. But I might find one! 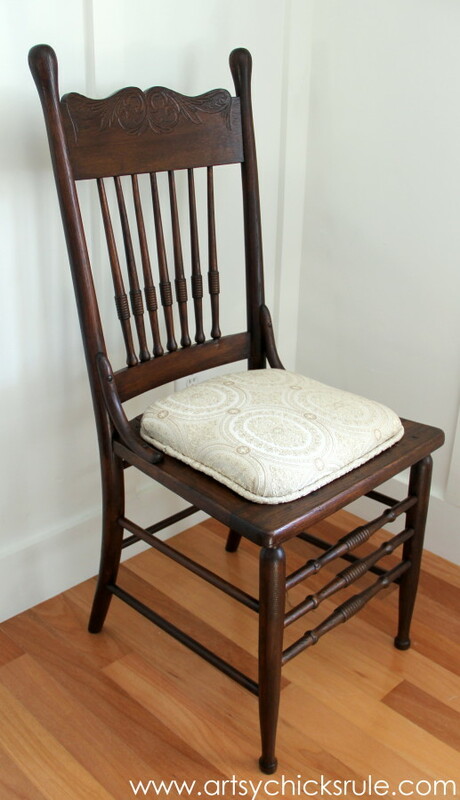 Want to see even more furniture makeovers like this press back chair using Java Gel Stain? Click HERE for more. Can’t beat it for $8…and a $5 piece of fabric. I struggled with this one a bit. But I’m actually very happy with how it turned out. And … I’m so glad I didn’t paint it. Check back in next week to see how I made this old beauty shine! 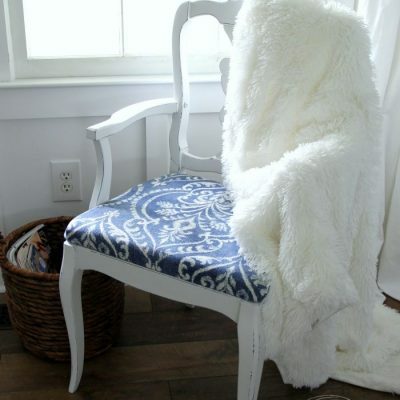 LOVE the chair. I have to ask a question about the Java stain. How many coats of stain did you use? Did you only have to do it one time, if you could explain to me how you actually applied the stain I would really appreciate it. I am a newbe to working on furniture and need step by steps instructions (like staining for the Dummy). I really appreciate your help if you don’t mind. 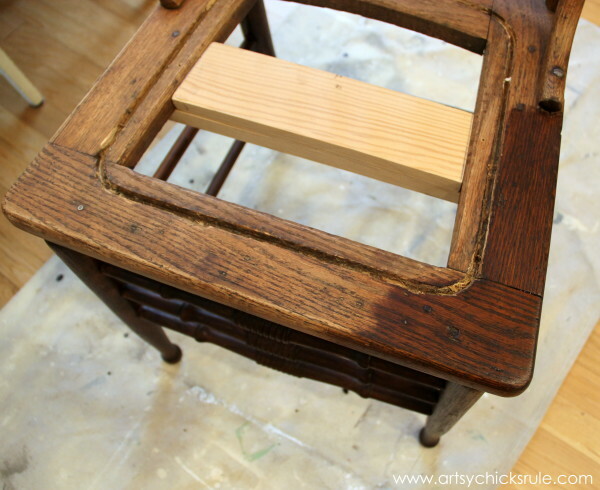 The stain looks so good on the chair you wouldn’t know that you redid it. Thank you for sharing all of your great works. I only used one coat. (lightly sanding beforehand) I used an old rag (tshirt) to apply. Just wipe it on and in the wood. Let it dry overnight for best results. Then you can spray it with poly from a can or apply with a brush. I like the brush best because I can control the finish better. But spraying is easier. Lightly brush over all areas, as if you are painting, applying the poly. Watch for runs, especially on a chair, or sides of furniture. 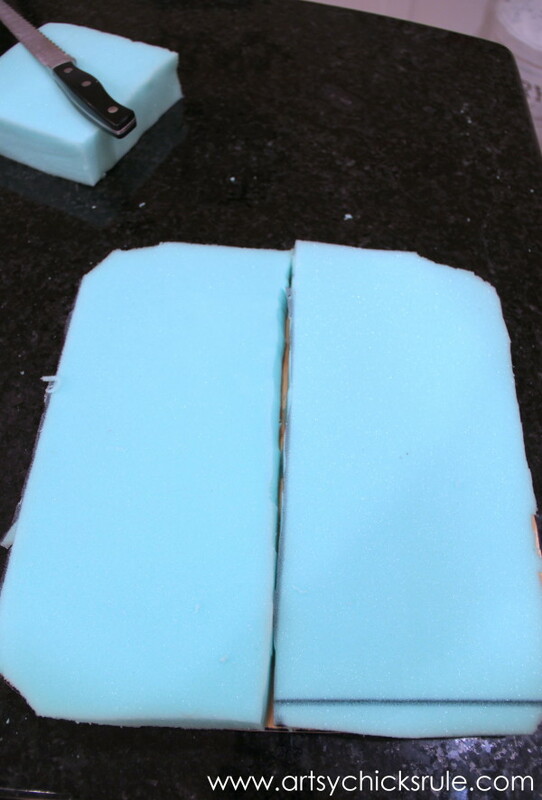 Can you post the info on how to make piping without sewing? 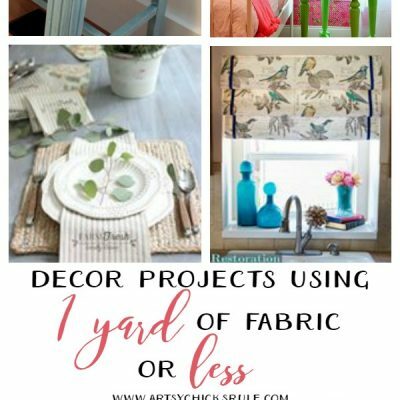 I can’t sew either and I am sure there are others that would love to know how to do this as well. Much appreciated. Your chair is really really nice. Just love the stain and total look of it. Keep on keeping on. (corny I know). 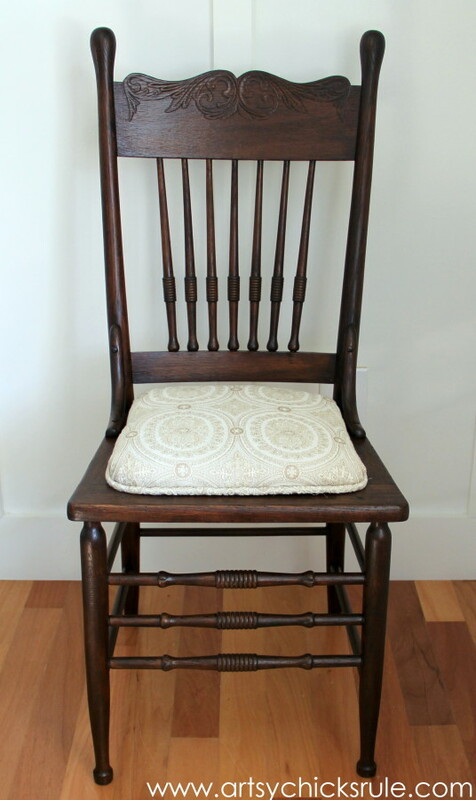 What a gorgeous pressback chair, Nancy! That lush contrast is perfect. Great job! Such a pretty chair with all that detail. I would have been torn between painting it and staining it too, but I think you definitely made the right choice! The piping really gives it a nice finished touch. Great makeover! Nancy the darker stain was a brilliant idea. I have wanted to try Java Gel Stain for a while now! 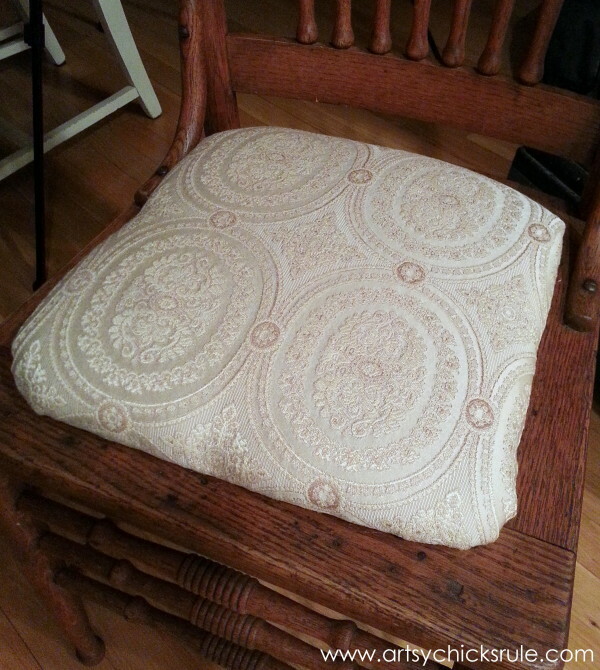 The chair looks so much better and great job making the new seat cushion! 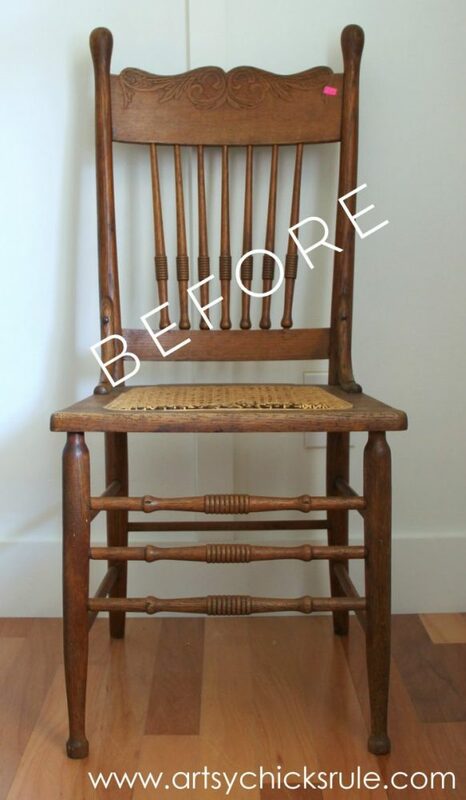 I love how you brought this chair back to life! It’s beautiful again! Thank you Melody! I think it may stay!! Thank you Christy! :) It is, I love this stuff! And yes, your piping tutorial was great..and I’m so sorry I forgot to link it (and my other links too, duh!)! lol But all fixed and now everyone can see how to do it! 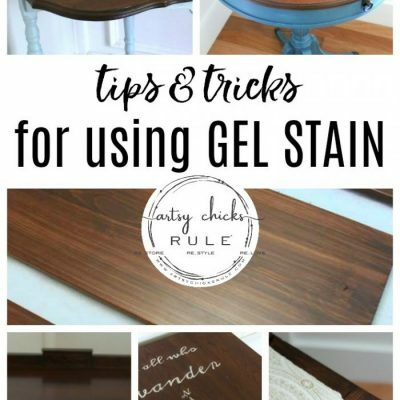 I have use General Finishes gel stain for a few years now. 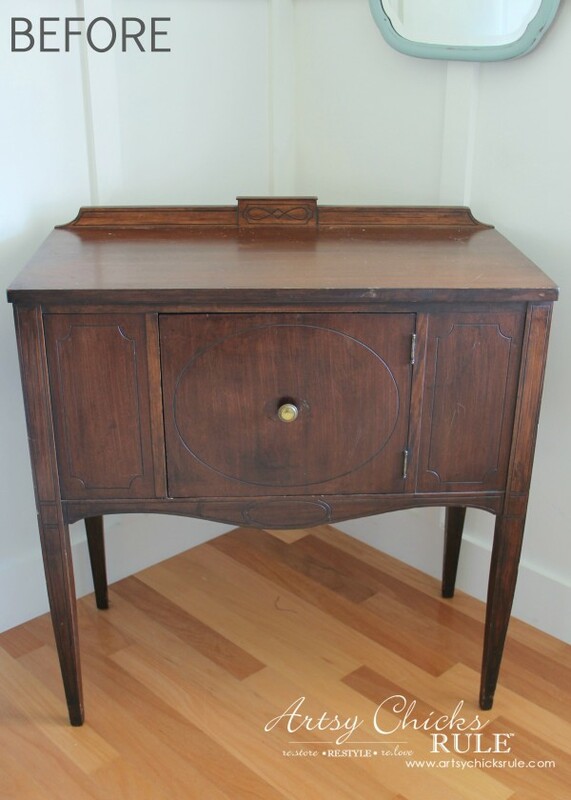 It did a wonderful job making a basic oak vanity new again. I have used it on both new pieces and older ones that need some love to make them shine again. I highly recommend it. As far as I know you can only get General Finishes from Amazon and the Woodcrafters store. 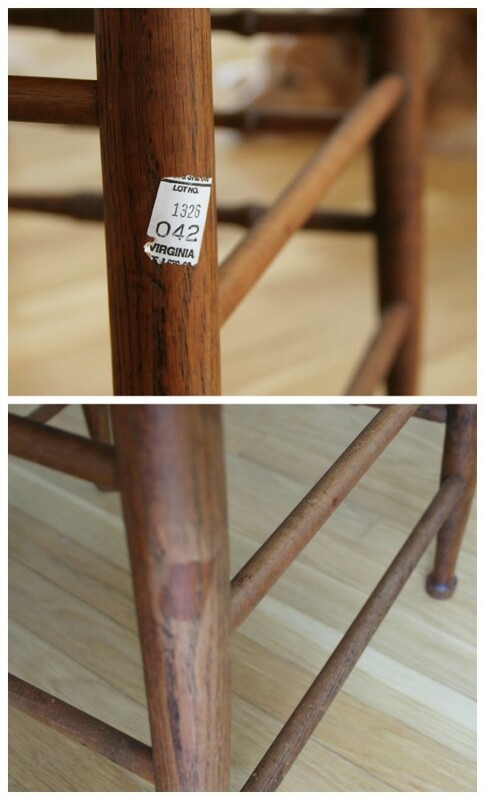 The darker stain is exactly what this chair needed. 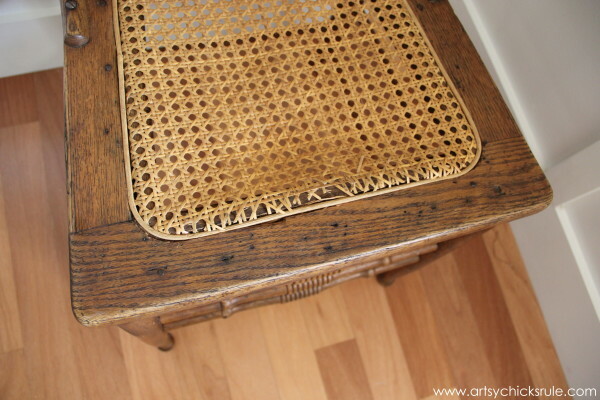 The wood looks so rich now and the cushioned seat you made would definitely be more comfortable than the caning one. Great job! It is SO much more comfortable! Nancy- I absolutely love what you have done with your chair. You made the perfect choices! I don’t see how anyone could dislike the improvements you’ve made. 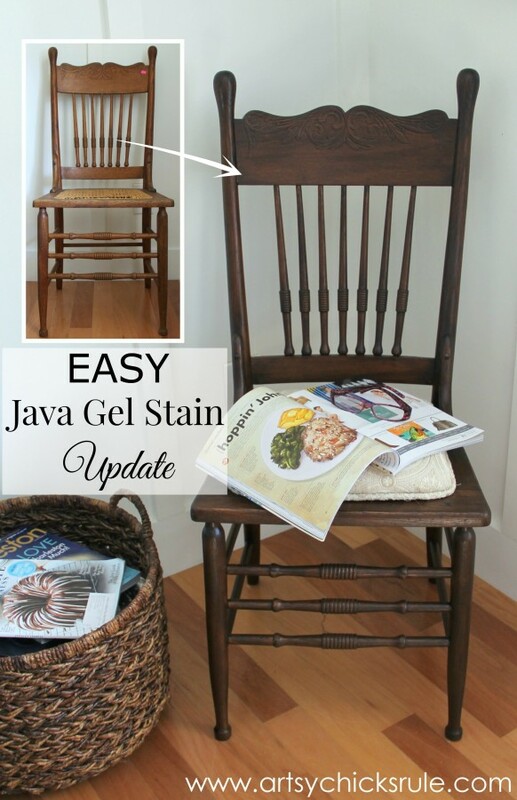 The java gel stain is perfect and the seat is a perfect foil to the darker stain! Great job!!! I love it so much better stained darker – it really does make the wood grain stand out more. 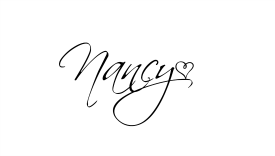 Very nice makeover Nancy! I love the binding – you did a perfect job. Love it!! It looks soooo much better now! Oh, wow. I REALLY like the dark stain. I probably would have painted it, too. BUT, this looks fresh and clean. Thanks for all the info, Nancy. I am really impressed. It looks so good! What a great transformation! That java gel rocks! Thank you for the inspiration. 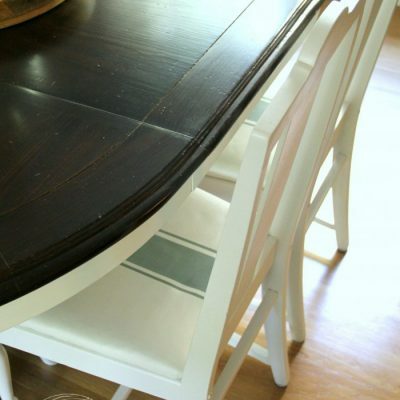 I have a solid oak dining room table and chairs that i would love to update. I can show my hubby your results and who knows, i may be staining this weekend. Thanks again! Thanks for adding the no sew trim info. It was easy but I didn’t love doing it!! I’ll leave that sort of stuff to Christy!! ;) But it was very do-able. 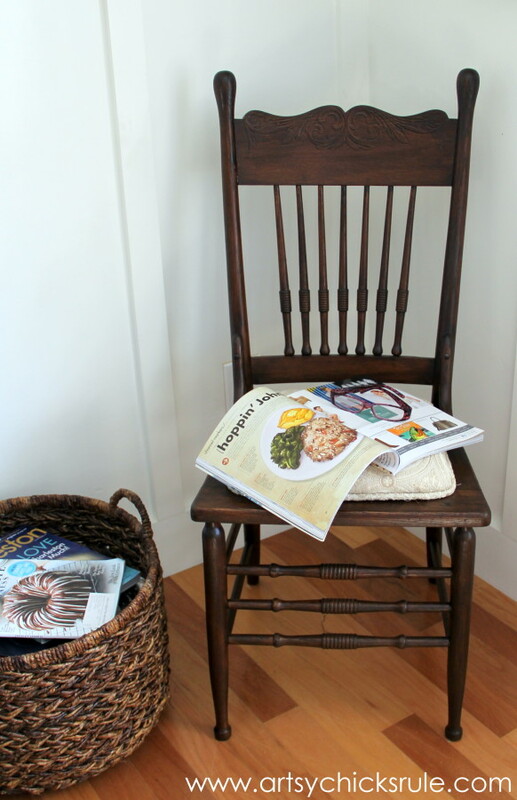 Wow, That chair is really beautiful now Nancy. You work like I do. If you don’t like it….keep working with it until you do! Thanks so much Kathy :) Yep, that’s the only way! Love the color stain. It really puts new life into a cast off chair. Such a great makeover! Thanks Jeanette! I love it, it’s really easy to work with too! How does the seat stay on the chair did you hot glue gun the seat to the support ? Love your chair and your spirit. This project gave me a good laugh. I had the same exact chair, even the cane was broken like yours. My friend found them on my street many years ago. I must have worked on this one for 20 years (of course, not continuously!) I whittled dowels and glued them and tied them up, etc. etc., but never really finished it. This year I had a garage sale and put the chairs out for $5. a piece. Nobody wanted them. Finally, a woman was buying them for one dollar a piece for her card playing friends. After we spent 15 minutes squeezing 5 of them into her car and she paid me the $5, she told us that her friends were really hefty people. My friend talked her out of buying the chairs, saying they might break the chairs and get hurt, so she decided not to buy them. We spent another 15 minutes trying to get them back out again, but we had a good laugh about the whole thing and now, you’ve reminded me and made me laugh again. P.S. I put them out for garbage pickup early, hoping someone else would take them, but nobody did.. Too bad you don’t live in N.Y., you would have done them justice! Thanks for all your interesting thoughts and projects.